When Tamara Dimovska needed treatment for her rare and debilitating spinal disorder, her family was told that Macedonia, a country of just two million people, didn't have the necessary specialist to perform the operation. They sought to take her abroad for the complex surgery, but the country's public health insurance fund repeatedly denied their application for funding. The family used Facebook and held events to ask for donations so that they could pay for the medical costs abroad. Authorities then approached the family and asked them to stop the effort, promising  that state medical services would take care of it — a new medical center would soon open nearby and 9-year-old Tamara could have the operation at home. But delays persisted and then it was too late. Tamara died on February 9, 2015. Amid a series of protests on public expenditures and corruption, a mass outcry erupted in the capital city of Skopje when independent media sources alleged  that authorities intervened in the girl’s case because they wanted to showcase the child as the new medical center's first successful case. “So she died waiting, died for their PR,” said Filip Stojanovski, a writer for Global Voices. The decision was made by committee and signed by the committee's deputy head, Aspazija Sofijanova, who admitted in recent testimony that she had done so against her professional judgement because she was told “from above .” Sofijanova is a highly politicized figure who state-affiliated media routinely depict as a humanitarian who supports ruling politicians whenever possible. I research, I talk to physicians and I get the information that the Spinal Center for Scoliosis is in the works and should be opened in two months. I tell myself is it possible that this is the reason for delaying Tamara's surgery. Do they keep her under wraps in order to have another photo op? Medical doctors tell me that they have expert colleagues in the country, for whom such an operation would be easy, a “piece of cake.” Why, then, the opinion of the Consilium [committee] stating the opposite? I publish everything, but can't get official statements from anybody. 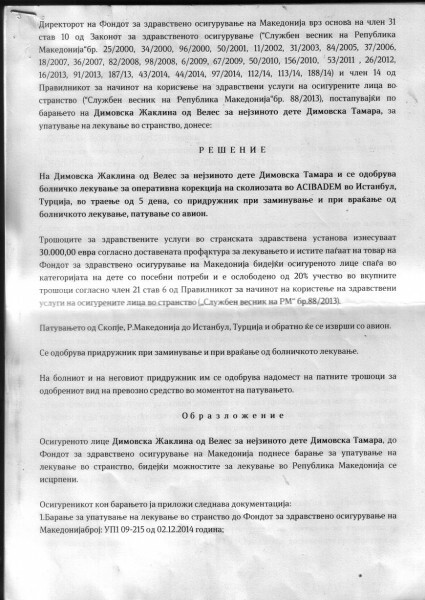 Shortly before her daughter’s death, Zhaklina Dimovska was reported  to have approached the Prime Minster Nikola Gruevski and personally begged for his mercy to obtain approval for the surgery. An administrative letter dated February 6 approving the operation was not sent until February 11 , two days after Tamara died. The letter, pictured below, contained no expression of condolence. Over the last two weeks, Macedonians have taken to social media  using the hashtags #ОставкаЗаТодоров  (resignation for Todorov) and #ТодорOFF  (Todorov-OFF), calling for the resignation of Health Minister Nikola Todorov, who had promised Tamara's family in November 2014  that the government would pay for her surgery. Over 18,000 people have lent their support to the campaign, led by the family and media personality Ognen Janeski . 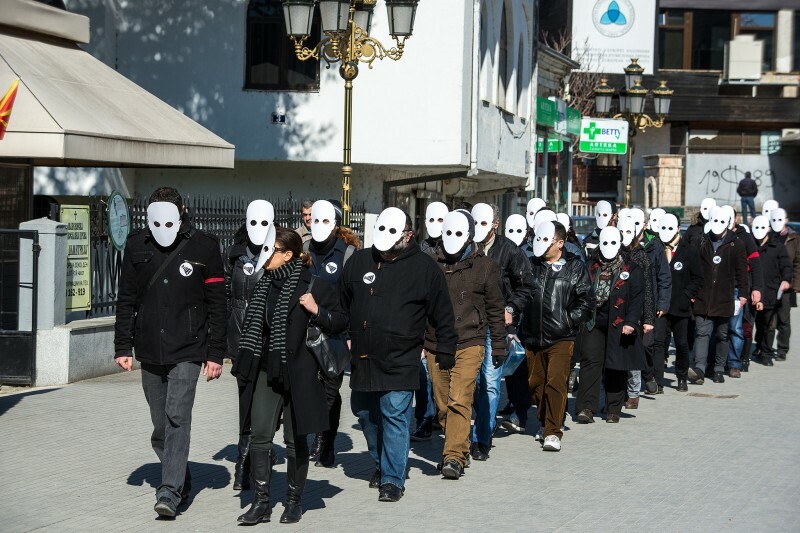 On February 19, a small group of people wearing blank masks , as a symbol of the faceless heartlessness of institutions, protested  in front of the Ministry of Health. Organized by the civic platform AJDE! , the demonstration demanded resignations from the health minister, committee members, and health insurance fund managers and board members. A few days later, thousands of people  led by Janevski and Tamara's mother gathered  in front of the health insurance fund and marched through the main streets of Skopje  to the Ministry of Health. No medical professionals involved in the case have faced prosecution as of yet. In light of public protests, two public health insurance fund officials resigned . The Helsinki Committee for Human Rights has filed charges against Todorov  for abuse of power and authority in the case, but it's unclear if the public prosecutor will act on them. Todorov has defended himself, saying he did everything he could “and even more than that ” to approve the funds for Tamara's surgery. In a separate interview on state TV, he referred  to the girl's death as an unfortunate event that overshadows his reforms to the country's healthcare system. On February 21, he announced  that the government will be hiring 2,000 new medical personnel — 700 doctors and nurses, and the rest janitors and other technical staff. Conversations on social networks and coverage in the country’s small but fierce independent media today provide ample evidence of the need for greater accountability among public officials in the country. Between public outcry over economic reforms and unemployment — which is the highest in Europe, at 30% — and the case of Tamara Dimovska, it seems that Macedonia may soon reach a boiling point.